Idea and base animated svg came both from openclipart. Jarda made this one of a single cube, where each slice was a separate clone of a path in the defs section -moved the parents to a new layer and made them into groups instead for the custom colours. Also, the original used one animation definiton for both rotating in a full circle -switched that to one spinning and another going back and forth between 15° and -15°. Quite complicated approach with all the "unnecessary" groupings. Notes so far: chrome renders the rotation right, whereas firefox is off-center. The reflection is especially nice. That's a masked clone with an overlaying gradient. Tried adding in a wavy filter but it didn't work. Wow, from that rough sketch you got to this!!! Determining the correlations between bike parts and letters looks super hard to me. Did I count ~ 23 keyframes? How did you make them? Just 7 keys. Used linear interpolation and tweaked the result to look better. The rest in the animation is duplicates of the two ends so there is a still part. The hardest part for me would have been deciding which part of text was going to become which part of the bike. -Too bad these are 2400 px/2400 px and the forum cuts them off? Tried scaling them down while put inside a group however then the animation doesn't work. Yes, probably doable. Will you try remixing it? Having a hard time figuring out what works and what doesn't myself. Can look at existing svg codes, extract the related part, paste it into the new drawing yet still -it just hardly works. Instead, used the existing animated files and wiped literally everything out except the animation itself and pasted in the new drawing elements. Wether it was a mismatch in id-s or unsupported grouping, I'm clueless. 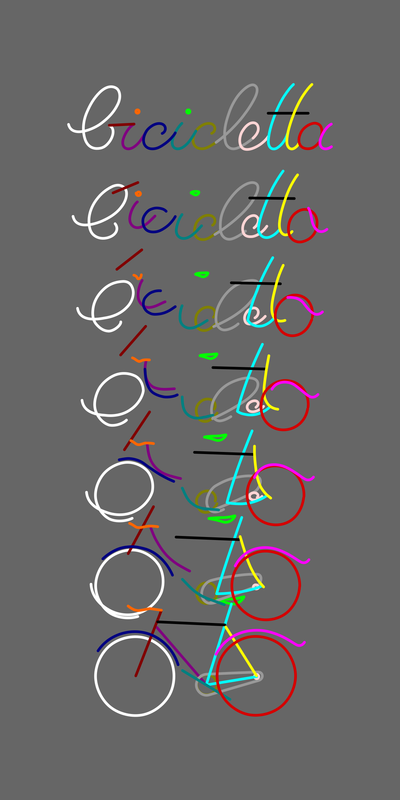 My idea was to put more bicycles on the "treadmill", and adding in some phase offset between the animation start-ending time signatures as the next step. Can't think of a possible way of doing so. As, even if the animate motion's time signature can be changed, the morphing animation should follow -which cannot really do that. Maybe just by adding in more start and ending keys... no, that would mean tweaking every phase's morph animation keys so it'd need a complete reworking. Trying to insert an audio to this one. So far could make this one work, but have to remake the audio file to fit with the animation. Have it in mp3 but somehow after converting it base64 it doesn't get "rendered" by the browser. Sorry, Lazur - I'd need to look it all up, too, before I could get started remixing anything or figuring out how to combine these things - and there's so much else that I need to do... Cool that you're now experimenting with sound! Haha I love the rabbit the most! the last one is nice too! I cant imagine how hard was it to make the bike? Last edited by Zech on Sun Feb 18, 2018 12:36 pm, edited 2 times in total. I posted this comment to your feature request, but also posting here, for other readers. It's below. This one makes SMIL animation, which is very different from GIF animation. No guarantees about those. They might not even work. I've never tried them. But I think the first one is functional. It seems like I hear more and more talk (mailing list, meetings) about funded development. Of course you can donate to Inkscape at any time. But it goes into a general fund, and is not targetted to any particular development goal. But when we have actual, specific funded projects, you can donate for that particular project, if it's one you really want. fyi - GIMP already has native animation - again, not as slick as Illustrator - but again, that darn price tag says it all! I think Lazur has been trying various different techniques, fwiw. Exuse me mr. Brynn. But that's not exactly what I mean. I know you can make gifs on gimp. Its the bone system I want. Anyway enough about the link. Since you're asking for extension, that's what made me think you wanted GIF animation. I answered you other recent message about animation, with other info.